Key international players on the former Yugoslavia released extensive new documentation on Safe Areas in Bosnia on 23 November, drawing attention to the failure of the United Nations and NATO to protect tens of thousands of refugees expelled from their homes by a brutal ethnic cleansing campaign. Timed to coincide with the 20th anniversary of the Dayton peace agreement, today’s release includes a fully annotated 291-page transcript of a conference attended by representatives of more than a dozen countries and international organizations. 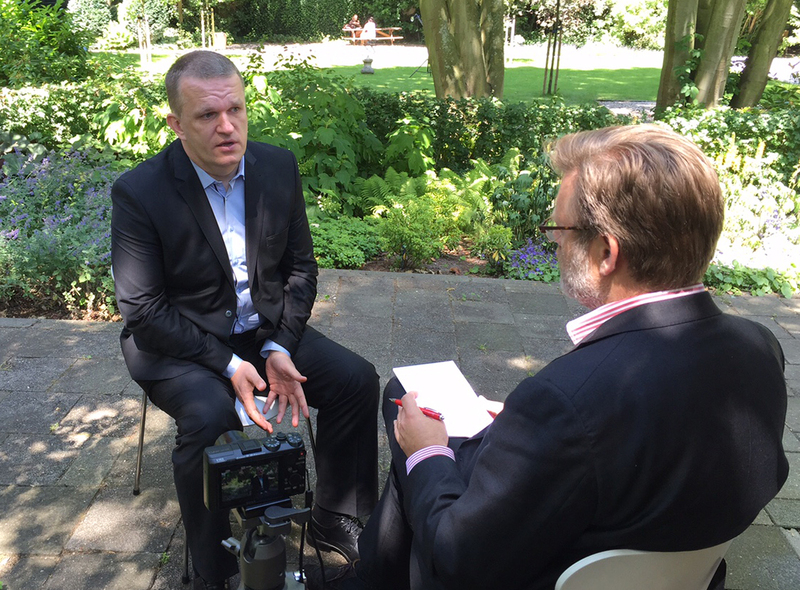 The conference, which took place in The Hague from June 29 to July 1, 2015, was sponsored by the United States Holocaust Memorial Museum and The Hague Institute for Global Justice, with support from the National Security Archive at George Washington University. Conference participants included Special Representative of the UN secretary-general Yasushi Akashi, European peace negotiator Carl Bildt, the commander of UN forces in Bosnia, General Sir Rupert Smith, former Bosnian prime minister Hasan Muratović, and Srebrenica survivor Muhamed Duraković. Also in attendance were three former members of the UN Security Council and the current UN High Commissioner for Human Rights, Zeid Ra’ad Al-Hussein. Under conference ground rules, the discussions were held behind closed doors, pending the release of an approved transcript with supporting documentation. The Srebrenica symposium was the second in a series of conferences with the theme “International Decision-Making in the Age of Genocide” that began in 2014 with an in-depth examination of the Rwandan genocide. The killings of more than 7,000 Muslims by Bosnian Serb forces in Srebrenica in July 1995 has also been termed a genocide by the International Criminal Tribunal for the former Yugoslavia. Lack of a strategic vision for ending the war. Unable to agree on a workable peace plan for Bosnia prior to July 1995, western leaders adopted a series of stop-gap measures designed to create the impression of “doing something when, in fact, we were not willing to do anything seriously,” according to former Clinton administration official Jenonne Walker. Lack of a clear UN mandate. According to former UN Secretariat official Shashi Tharoor, the UN operation in Bosnia failed because of the lack of a “coherent, clear, implementable mandate” and the “political will” to enforce the mandate. Primary source documentation from the archives of western governments, the UN, and the Yugoslav war crimes tribunal is being collected by the National Security Archive, and will be released through the websites of the participating institutions. “We want to provide historians, journalists, and scholars with access to the primary source documents that show how decisions were taken in real time,” said Archive director Tom Blanton. The Dutch battalion’s commanding officer, Col. Thom Karremans, reports to his superiors in Tuzla and Sarajevo that early in the morning on July 6, 1995, the Bosnian Serb Army (BSA) started shelling the Dutch battalion (Dutchbat) headquarters and the town of Srebrenica. Writing on July 9, Karremans describes three days of attacks by the BSA “suppressing Dutchbat thru intimidation” and “according to a premeditated and well-organised plan.” He explains the circumstances of Dutchbat withdrawal from various points, and surrender of two Dutchbat crews, and gives an analysis of the situation: “The situation in and around the enclave is extremely tense again … All refugees and inhabitants of villages in the surrounding areas left their houses and entered the town of Srebrenica, about 3 to 4 thousand persons” on top of the thousands already there. The report also mentions the controversial actions by the Bosniak military (BiH) trying to prevent the Dutch from pulling back the forward observation posts, and in the process, actually killing one of the peacekeepers. With UNPROFOR commander Gen. Rupert Smith on routine leave (he would rush back from vacation as Srebrenica fell), his office issues this warning directly to Gen. Mladic and through the press denouncing the attack on Srebrenica as “totally unacceptable” and a “grave escalation of the conflict.” The warning notes that 32 of the Dutch peacekeepers are already captives, that three U.N. observation posts have already been overrun, and that the Bosnian Serbs are “firing indiscriminately into the Safe Area.” Instead of interpreting the Serb offensive as already triggering the need for air strikes to defend Srebrenica, this warning simply threatens another line in the sand, a “blocking position” set up by the Dutch peacekeepers, that would be defended (a largely empty threat) by “NATO Close Air Support.” The Dutch had no weapons that could take on Serb tanks without air strikes, and the pinprick strike that would come on July 11 proved too little too late. This extraordinary Bosnian Serb Army order obtained by the ICTY prosecutors documents the BSA decision on July 9 to change from simply “squeezing” Srebrenica to the “takeover” of the town. Gen. Mladic’s top deputy, Gen. Tolmir, reports that the President of the Republika Srpska (Radovan Karadzic, himself now on trial at the ICTY) has been informed of and is satisfied with the “successful combat operations around Srebrenica.” The President agrees to the “continuation of operations for the takeover of Srebrenica, disarming of Muslim terrorist gangs and complete demilitarisation of the Srebrenica enclave.” The contrast between the “Muslim terrorist gangs” language and the phrases about protecting the civilian population and war prisoners suggests that the latter wording falls into the cover-your-rear category. These notes from the deputy commander of Dutchbat describe the tense discussions between the Dutch peacekeepers in Srebrenica and the Bosnian Serb attackers on the evening of July 10, with the Serbs insisting that since the U.N. had not completely disarmed the Bosniak population (several thousand Bosniak soldiers were defending Srebrenica), the Serbs would do it by taking the enclave. Maj. Franken tersely summarizes the U.N. demand that the Serbs withdraw to the old lines, and threatens “[m]assive air strikes against all BSA targets in and around the enclave” if the Serbs do not comply starting at 0600 hours on July 11. The document displays the enormous disjunction between Dutchbat’s expectations of air strikes and what U.N. commanders in Zagreb (Janvier and Akashi) ultimately approved for later on July 11 – a small “close air support” strike consisting of six strike aircraft, only two of which actually dropped any bombs. This message from the head of the U.N. Peacekeeping Department, Kofi Annan (actually signed by Annan’s deputy, Iqbal Riza), to Akashi in Zagreb reflects the fog of war on the day before the Bosnian Serbs would sweep through Srebrenica, as the U.N. Security Council focuses less on the Serb attack than on the death of a Dutch peacekeeper at the hands of the Bosniak defenders of Srebrenica, attempting to prevent a Dutch pullback. The message describes the Secretary General’s representative, Chinmaya Gharekhan, informing (actually misinforming) the Security Council that the killing had taken place when the Bosnian Serbs were “paying [sic] heed to UNPROFOR’s strong warning,” and that there had been no request for air strikes from Dutchbat. Here again is the confusion between “Close Air Support” [tk: why upper case? Not in previous doc header] which might consist of only two actual bombers, and the “massive” strikes that would have been necessary to deter the Serbs. As Srebrenica is falling on July 11, the acting commander of UNPROFOR Sarajevo (in Gen. Rupert Smith’s absence) issues orders for the defense of the Dutchbat and the protection of refugees in Srebrenica – orders that are almost immediately overtaken by events. UNPROFOR is to enter into negotiations for an immediate ceasefire with BSA forces and is not authorized to surrender any weapons or military equipment. Forces are to be concentrated on the Potocari camp, including the withdrawal of observation posts and the taking of “reasonable measures” to protect civilians and refugees. 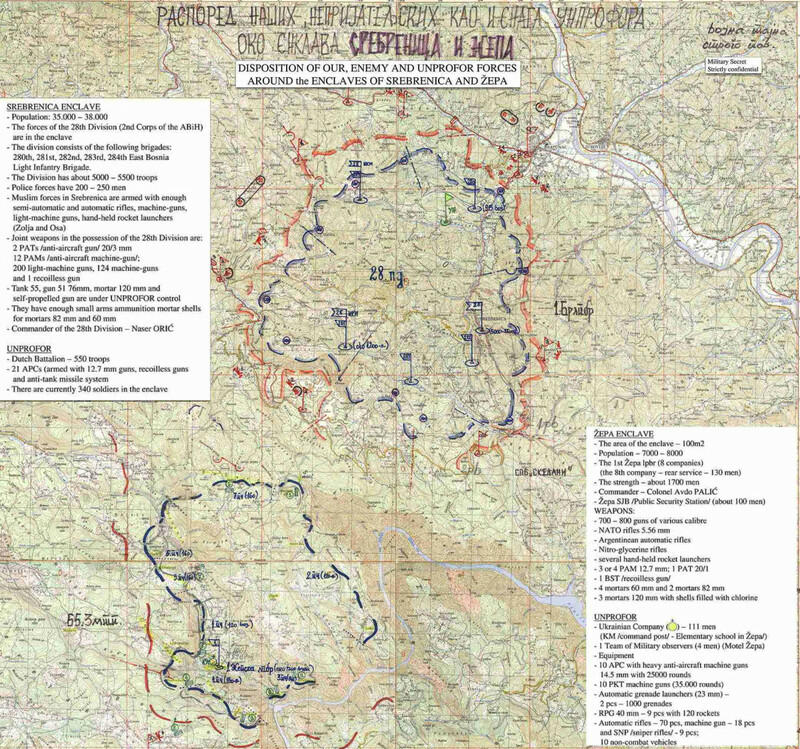 The use of close air support is authorized if necessary to defend forces from attack – an order that leads to the pinprick bombing that afternoon destroying just a single Serb tank. Karremans emphasizes the deterioration of the situation and strongly advises “negotiations today at the highest level” as the only option. Galbraith’s cable is based on an interview by his future wife, Tone Bringa, then working for the U.N. in Zagreb, with a Srebrenica survivor who made it across the mountains to Tuzla. The refugee had survived a Bosnian Serb massacre of captive Muslim men and boys only by other dead bodies falling on top of him, and his story suggests that “many, if not most” of the 5,000 or more military-age Srebrenica men in Serb custody have been murdered. Galbraith warns that the 16,000 people in the Zepa “safe area” are also likely at risk for slaughter, so there should be “reconsideration of airstrikes to help Zepa;” but Vershbow’s cover note undermines that recommendation. Combined with requests from U.N. Ambassador Madeline Albright’s staff to acting CIA Director George Tenet, this cable and the resulting White House attention spark intensive CIA review of overhead photography, and additional spy plane missions, that ultimately produce visual evidence of the Bosnian Serb roundup of Muslims and the resulting mass graves near Srebrenica, even though the erroneous location given in the cable (Konjevic Polje) is approximately 35 miles from the actual site of this particular massacre. The July 22, 24, and 25 extracts provide remarkable detail on the American policy process before the Croat offensive of early August: “we will not tell the Croatians not to do it” – that is, a “no light” that was seen by the Croats as a green light, for what ultimately became “a fundamental reshuffle of the deck” in Bosnia (see August 7 entry). This open statement by the prosecution in the Mladic trial at The Hague summarizes the evidence gathered by the Tribunal from witness interviews, intercepted Bosnian Serb communications, the Mladic diary, and other documents that together point to a rolling decision by General Mladic in early July 1995 first to squeeze Srebrenica, then to overrun it, and then (on the night of July 11 and morning of July 12) to order the systematic murder of captured Muslim men and boys. About the Conference: The “International Decision-Making and the Srebrenica Genocide” conference convened a group of key policy makers and officials over the course of three days in order to better understand the chain of events leading up to the genocide, as both an academic service to history and to guide future policymaking. 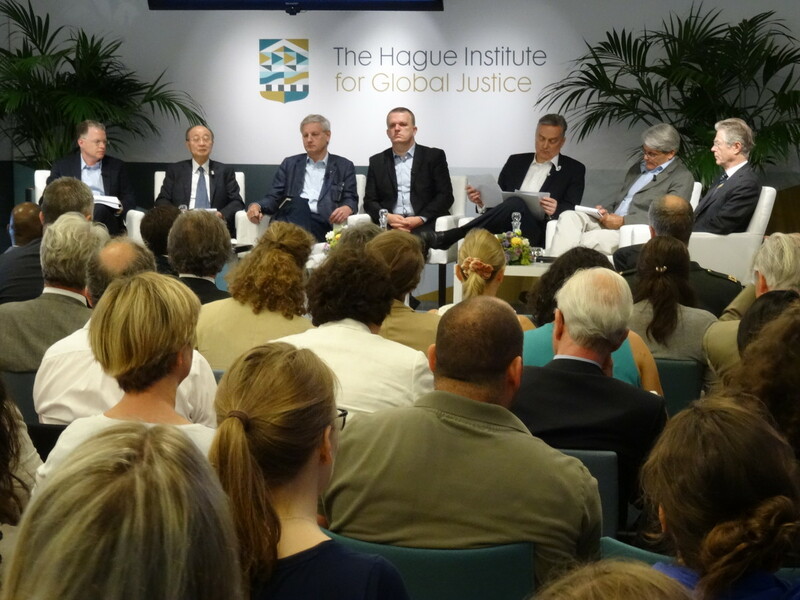 The conference, which took place in The Hague from June 29 to July 1, 2015, was sponsored by the United States Holocaust Memorial Museum and The Hague Institute for Global Justice, with support from the National Security Archive at George Washington University. Founded in 1985 by journalists and scholars to check rising government secrecy, the National Security Archive combines a unique range of functions: investigative journalism center, research institute on international affairs, library and archive of declassified U.S. documents (“the world’s largest nongovernmental collection” according to the Los Angeles Times), leading non-profit user of the U.S. Freedom of Information Act, public interest law firm defending and expanding public access to government information, global advocate of open government, and indexer and publisher of former secrets.